Here are the best cheap treadmills on the market today as selected by our panel of experts. They may not have all of the bells and whistles that some of the more expensive models have, but they will give you everything you need for an effective workout. Please note that if you are going to do some serious running, or are very tall or on the heavier side, you would be much better served with a more advanced treadmill. But for walking and light jogging, these should be just fine. They are all great low cost choices. What can you expect from the best cheap treadmills? The better machines will have decent sized motors, a variety of workout programs, heart rate monitoring and cushioned decks, as well as a few extras depending on which model you choose. 1. The Motor – Look for at least a 2.25 CHP (continuous horsepower) motor, which will provide enough power for your walks and jogs. Anything less and the motor might be overworked, or insufficient to support your workout. So keep an eye on that number as you are going through the specs of each treadmill. 2. Incline Capability – Make sure the treadmill has at least a 10% incline, which will allow you to change the angle and not only target different muscle groups in the legs, but also give you a better cardio workout. Although you don’t need incline, it’s a great way to reach your fitness goals quicker and make it more challenging, even if you’re just walking. All of the best cheap treadmills will have some incline capability. 3. Deck Size/Type – Look for a running deck of at least 55″ long and 20″ wide. This will give you ample space to walk or jog. (Note that the best treadmill for runners will have at least a 60″ deck to accommodate longer strides.) Also, make sure there is ample cushioning to absorb the shock and ensure minimal impact on your knees and joints. Our expert’s top choices all have good cushioning systems. 4. Workout Programs – This is something that only the best cheap treadmills will have…a diverse amount of built in workouts so you can change it up from one training session to the next. Look for intervals, distance, calorie, heart rate, hills and more, to add a little variety to your routine. Even if you are just walking, it’s helpful to vary your workouts to maximize your fitness results. 5. Warranty – The warranty is important, as it gives you a good indication as to the quality of the treadmill and whether or not it will last long and hold up to daily workouts. Look for lifetime on the frame, at least 25 years on parts and at least 1 year on labor. Anything less and you may just see some components breaking down over time. These are the most important things to look for, but some of the better cheap treadmills also come with heart rate monitoring, workout tracking, tablet/water holders, easy folding capability and more. So make sure they have the things you need, as mentioned above, and then you can move onto other features that you want. Which of the best cheap treadmills should you choose? As we most things in life, it’s really a personal choice when it comes to selecting the right treadmill. We give you three great options to choose from, but when it comes down to it you have to pick the machine that has the features and capabilities you are looking for. In some respects, choosing a cheap treadmill is an easier decision than buying a more advanced one, because a) there are less extras to take into account and b) there are fewer good ones on the market. By comparison, the $1000-$2000 price range is packed with good choices, because that is the most popular bracket. There are dozens of great treadmills in that range. Below $1000, the selection is more limited, so it’s easier to pinpoint the standout machines like the ones we chose above. NordicTrack, Horizon and ProForm all have a great reputation, and they offer solid treadmills for every budget and fitness level. The ones featured above are their entry level models, but they have many of the same features and capabilities as their higher priced counterparts. The NordicTrack C700 probably has the most extras: easy folding, adjustable cushioning, sound system, incline, tablet holder, iFit Coach workouts, etc. So if you are looking for the best cheap treadmill with the most features the C700 is going to be at the top. The Horizon T101 is one of the best selling treadmills on the market today, and is also the least expensive of all of the top recommendations. it has great cushioning, easy folding capability, speakers, water bottle holder and an Energy Saver mode. It’s a well built machine and a great value. The ProForm 400i is similar to the NordicTrack C700, as both are made by the same company, ICON Fitness. 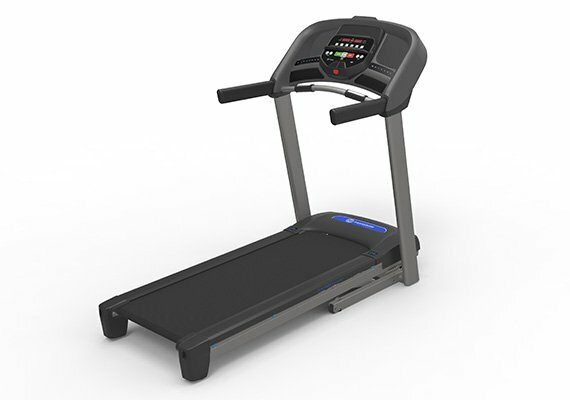 It has a nice Power Display, good array of workouts, iFit Coach as well as similar incline capability and cushioning. The C700 slightly edges this one out however. So we would probably lean towards the NordicTrack C700, with the Horizon T101 a very close second. But all three of these best cheap treadmills are absolute winners and will be a welcome addition to your home gym.